Air chilling lines provide an optimum result in the pre-chilling area. Shackles in different versions for one or two birds, hung on one or on both legs provide taylor-made solutions for any application and capacity. 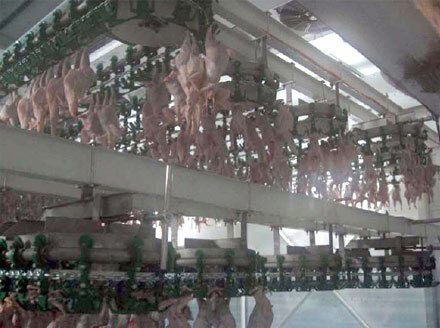 A special designed spray chilling system which can be installed in addition tot he evaporators grants a more effective pre-chilling of the birds. This system not only gives more efficiency but also is a necessary unit when processing hard scalded birds as it safely prevents bird colour changing.